I was hired to be on the 'Opening Team' for TGI Friday's restraunt from 1975-1977. At one point, six of us on the team traveled in a Friday's van to new sites and conducted training sessions for the new employees. Because we worked different times at the restraunt and there was only one vehicle, I would often walk from the hotel. I carried manuals, notes, and pens. While staying near Cleveland, Ohio, we were in a very picturesque and inspirational environment. • A briefcase is awkward, clumsy, inconvenient and confines one's hands while carrying. Holding the case can be tiresome when walking long distances. Even if there is a shoulder strap, it gets uncomfortable after a while. • A backpack is convenient and conducive to walking, but it does not look appropriate in a professional business environment. Because the backpack was soft nylon, it did not protect the materials and manuals well. Criteria: A comfortable handsome backpack that is as a hands-free briefcase carried on the back. 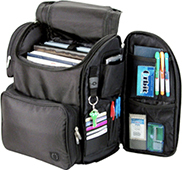 • A handy place for pens and pencils, small supplies, and toiletries. • Waterproof material and a flap for water-tight enclosures. • Stiff back and bottom to keep papers flat and neat. • Size - at least 9x12 - to hold a legal notebook. I had a nylon backpack that I had used for camping in Colorado. It was soft with no internal support, but was just the right size. To address the issue of the soft sides, I bought a styrofoam cooler in Cleveland, for about a dollar, and cut out an L-shaped section that fit snugly into the backpack. The section was square and about the size of the largest materials I would carry. The lower portion of the L served as a base that allowed the backpack to stand up on a chair or next to a table. This allowed easy access into the contents. The back of the L helped keep the papers inside neat and protected. 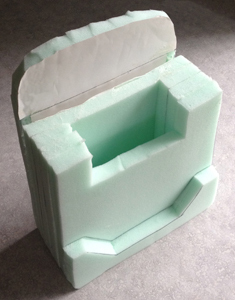 The styrofoam was so light it added practically no weight to the backpack. It worked great. I found and bought one with no extra pockets, stitching, or gadgets. The label, JanSport, cheapened the look a little, so I removed it. Now it was more sleek and more like a business briefcase. I have never been a fan of advertising a company after I spend money to buy their product. That is why I never wear logo teeshirts or put dealer decals on my car - if I am going to be a walking billboard for a product, I should be designated an honorary member of their sales staff and get paid for advertising their product. The soft sides of the backpack did not adequately protect papers and folders nor cushion a laptop or iPad. 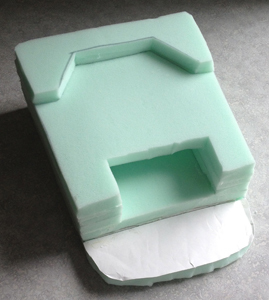 I constructed this foam insert to serve as both a stiffener and a protector. Some of the foam layers didn't work too well, so I made a few refinements and ended up with this insert that does work well. I still haven't settled on a good name. I most often just call it a backpack. There were some issues with the Solution 2 backpack that I had been using all semester for teaching and travel - the pocket for gadgets was tough to get into and there was no pocket or sleeve to cradle and protect the laptop (which is why I made the foam insert shown above). And, some of the papers inside got a little beat up. Below: the Zuca Business Backpack with a side flap that swung open and out of the way, exposing several pockets and slots. Those would be perfect for lecture gadgets - charger, slide advancer, cables, and connectors; and electronics while traveling. The main compartment had a padded laptop case and expanding files for papers. One was shipped it to me, for free, in 2 days. • I didn't need the two straps at the back that attach the briefcase to other luggage (the case would be on my back) - those were cut off. • The front had a big obnoxious pocket that I saw getting in the way as I slid the case under an airline seat - gone, cut off. • On the left side were two more pockets (who carries that much crap?). I made dry runs and loaded the case with everything I take to class and everything I take to NYC. There was plenty of room in the main compartment and in the gadget pocket, I just didn't need any more storage. 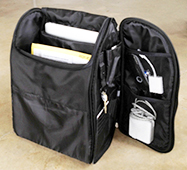 The two side pockets also prevented the case from sliding under the airline seat. Those pockets were cut off. • Each zippered pocket had 2 zipper handles. Two, when one is adequate. So I removed one of the handles. • The front of this case had a white Zuca logo. It was stitched into the fabric and too tough to remove, so I blackened it with a permanent marker. One can still see it up close but it no longer screams at you from across the room. I walk the dogs almost every day. One of them, Dallas the mutt mixed breed, is quite assertive. She usually pulls me along. Its not too comfortable. 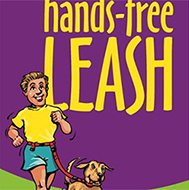 Holding the leash out in front of me prevents me from swinging my arms in a natural gait while we walk. I was first motivated to develop something that would allow my hands to be free. 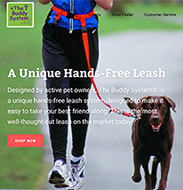 I clipped the leash to a belt loop - not bad. It felt good. Not only were my arms free, but she was now pulling me from my center of gravity, my waist, rather than from a shoulder socket. There was much less strain. I could walk and exercise with a natural rhythm. It was a little odd to pull from one off-center belt loop, however. 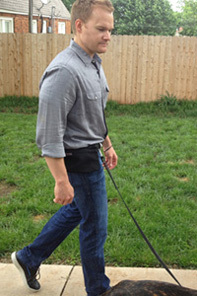 I pursued a belt that would hold the leash right in front. I did some exploratory shopping at Whole Earth Provisions, a camping, hiking, outdoors store in Dallas. There was a belt with a padded back (perfect). 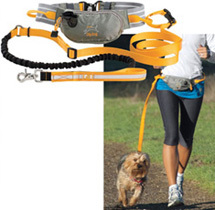 I got some metal D rings to hold the leash clip and even bought a pouch to attach to the belt to hold the Pooper scooper bags, and a water bottle for them or me while walking. 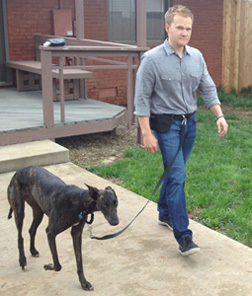 I tested the leashbelt while walking around Edmond. It was great. 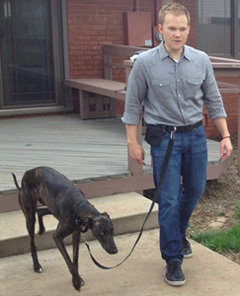 It was much more fun to walk the dogs without being pulled. I had pockets to hold dog stuff. Dates: Concept: winter 1996. Design and production: spring 1997. 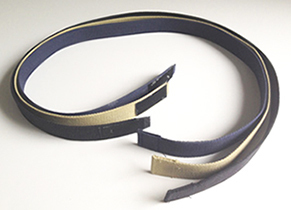 The leashbelt. 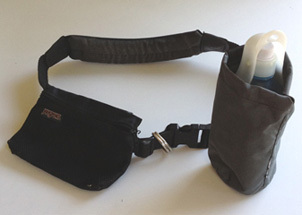 Accessories: a pouch for poop bags, keys, etc. and a pouch for a water bottle. 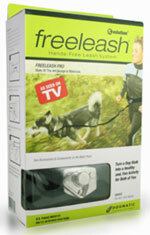 The leash link. 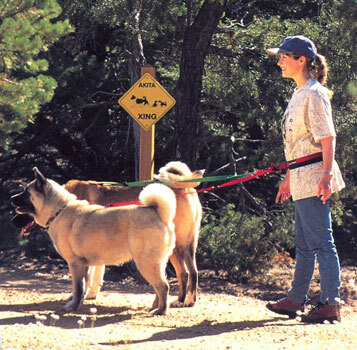 Thinking the leash belt was a marketable idea, I met with a patent attorney in 1997. For some reason, I didn't pursue legal protection. 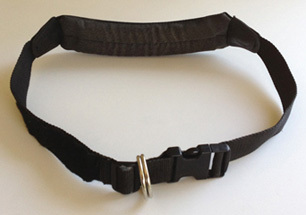 Now I wish I had because, while doing a patent search in 2005 for TravelPants, I found patents issued to others for similar leash belts - issued in 2002 and 2005, 5-8 years after I saw a patent attorney. 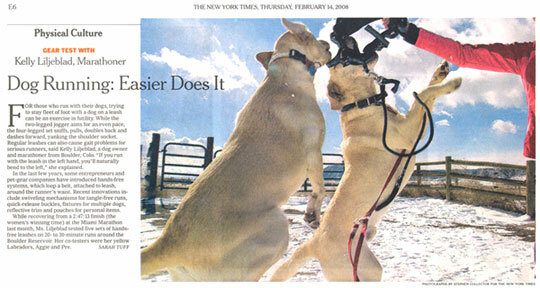 The New York Times ran an article in Febuary 2008 evaluating one of the other models. Bottom: Another version from 2017. Well, traveling can sometimes be a bummer. Take off your shoes? Take off your jacket, your belt. So many silly routines. 1. Reinforcing the cockpit door. 2. Passengers who fight back (as we have seen with the ranting pilot). But the TSA and the unnecessary procedures won't leave us anytime soon since they are now part of a huge bureaucracy and most of the public is too apathetic to request changes. So, how can we make the process a little more bearable? I often covertly move the que line ropes into a more efficient layout. I developed TravelPants with a removable pocket that holds all the metal stuff and can be easily removed to put in a bin. 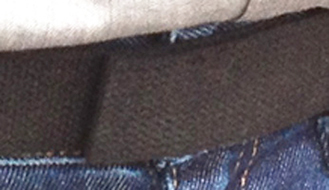 And, to avoid removing my belt, I now wear a belt with a velcro buckle. I searched online but could find only industrial belts. There were no consumer velcro belts. 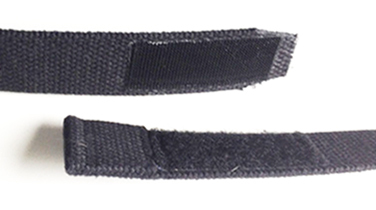 So I bought these standard web belts, cut off the buckle and had a seamstress glue and sew on the velcro strips. It works well - adjustable, easy to operate, and I can leave it on at the airport. 2. Easy to put on and take off. Pullover, collar not really necessary, pocket not necessary. • Front pockets big enough for hands. Back pocket big enough for wallet. Subtle colors and patterns, natural earth colors. Don't compete with the face and body - enhance it. No white (shows dirt).